The Bachelor’s Degree Program of the Business Administration Department is a 240 ECTS credits program of 4 years composed of eight semesters, each with a 30 ECTS workload. One ECTS is equal to 25.5 hours of student workload per semester. IAU thrives to train business leaders that are up-to-date with international business structure and economic issues and we are keen to develop creative and innovative solutions. Our academic framework; therefore, highly values analitycal approaches and is science and technology driven. Throughout the Business Administration Programme (English), we aim to provide our students with key managerial and executive capabilities and skills. Our department have well-recognized, national and international, staff members who are professional academics with unique significant success records. Moreover, our students are encouraged to pursue internships in a spectrum of distinct and reputable institutions. We are eager to train future businessmen and women with a global vision and advanced English communication skills. 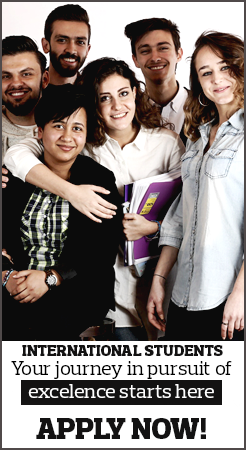 That, by return, encouraged a number of foreign students to participate to our program in the last few years. International academic exchange programmes have been motivated and inspired for further educational activities so that they are fully prepared to be global business leaders.